If you've spent a lot of money on your gaming rig, Arkham City might just be the game that lets you really get some use out of it. 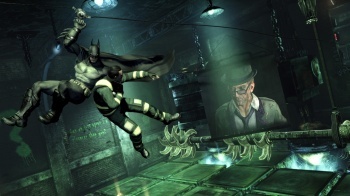 The PC version of Batman: Arkham City won't just be a straight port of the console version. Far from it, in fact: Rocksteady is including additional support for Nvidia's 3D and PhysX effects, so if you've got the hardware to run it, you're in for a pretty special experience. According to PC Gamer, the 3D effects really stand out, thanks to all the gliding and swinging that Batman does in the game. It notes, however, that the game suffers from the same problem as a lot of 3D media; everything gets darker, and as it's a Batman game, Arkham City is pretty dark in the first place. The PhysX extras make the combat more visceral, with PC Gamer using the example of a fight in a courtroom, where a wooden wall splintered when Batman threw a thug into it. The game will also have DX11 visual effects, again, provided you have the hardware to take advantage of them. The extra bells and whistles on PC aren't going to dramatically change the game, but will give it a little extra edge, not to mention giving PC gamers a chance to get some more use out of the hardware that's cost them so much money.